Many of the classic Catholic books, both fictional and non-fictional, can be hard to find. Luckily, technological advances have put them right at our fingertips...literally, your keyboard. And if you have an electronic reading device, most books on these websites can be directly downloaded to your device, depending on the format. Archive.org, Open Library and Google Books have very large collections. Project Gutenberg and Many Books are smaller but growing. Save for Google Books, each website has a multitude of formats to choose from for download, dependent upon your particular device. Or you can just read online. The cost: only your time. Just a sample for starters. It was announced on Sunday that the Latin Mass located in the Akron area has been assigned to St. Sebastian, 476 Mull Ave, Akron, Ohio. High Mass at 1pm and confessions heard at 12:30pm. This Lent, many of us have not had the opportunity to attend a parish retreat or mission. However, you can do this in your very home. I have found a very poignant talk entitled the Passion of the Church. It was given by a priest of the Fathers of Mercy to a Fraternity of St. Peter parish. I whole-heartedly encourage you to download and listen to this MP3 before Lent's end. This priest hits home on what is really happening in our beloved Church these days. As the Mystical Body of Christ we are undergoing a passion. 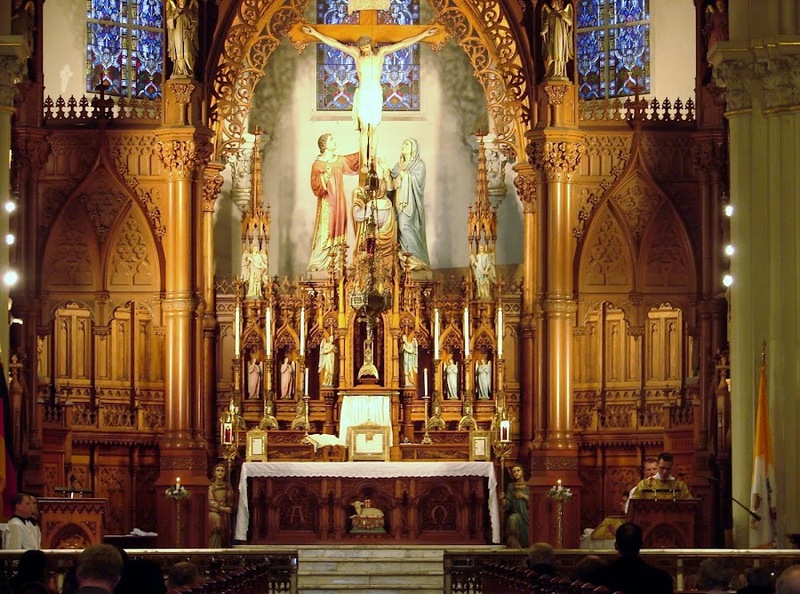 Moreover, he points to what we need to do as Friends of the Traditional Latin Mass. I trust you will find this talk informative, eye-opening, challenging, and full of encouragement and hope. "The Angelus is a short practice of devotion in honour of the Incarnation repeated three times each day, morning, noon, and evening, at the sound of the bell. It consists essentially in the triple repetition of the Hail Mary, to which in later times have been added three introductory versicles and a concluding versicle and prayer. The prayer is that which belongs to the antiphon of Our Lady, 'AlmaRedemptoris,' and its recitation is not of strict obligation in order to gain the indulgence. From the first word of the three versicles, i.e. Angelus Domini nuntiavit Mariæ (The angel of the Lord declared untoMary). the devotion derives its name. The indulgence of 100 days for each recitation, with a plenary once a month. was granted by Benedict XIII, 14 September, 1724, but the conditions prescribed have been somewhat modified by Leo XIII, 3 April, 1884. Originally it was necessary that the Angelus should be said kneeling (except on Sundays and on Saturday evenings, when the rubrics prescribe a standing posture), and also that it should be said at the sound of the bell; but more recent legislation allows these conditions to be dispensed with for any sufficient reason, provided the prayer be said approximately at the proper hours, i.e. in the early morning, or about the hour of noon, or towards evening. In this case. however, the whole Angelus as commonly printed has to be recited, but those who do not know the prayers by heart or who are unable to read them, may say five Hail Marys in their place. During paschal time the antiphon of Our Lady, 'Regina cæli lætare,' with versicle andprayer, is to be substituted for the Angelus. The Angelus indulgence is one of those which are notsuspended during the year of Jubilee." A few notes before we start the lesson. The Ave Maria is not included in this lesson. You can find it in Lesson 04. A Latin letter h is generally thought of as a note of aspiration, not pronounced as it is in English. Ecclesiastical Latin has two peculiar words in which the h sounds like k. One of those words is in this lesson: mihi. Something we have not addressed before is the Latin words which contain the consonant combination gn, as in digni. We will pronounce it the same way we pronounce the common pasta dish, lasagne: lah-zah-nyah. The Angelus may not be as familiar today as some other prayers, be they Latin or vernacular. With that in mind, EWTN provides a good translation here. This concludes the sixth lesson. Practice often. Lord, I am not worthy. ...13 And Jesus said to the centurion: Go, and as thou hast believed, so be it done to thee. And the servant was healed at the same hour. Devotion to the Mother of God has no shortage of artistic representation. I shall see him, but not now: I shall behold him, but not near. A STAR SHALL RISE out of Jacob and a sceptre shall spring up from Israel: and shall strike the chiefs of Moab, and shall waste all the children of Seth. The most popular of all Marian prayers, the Ave Maria has two distinct parts: scriptural and intercessory. The first part's use in the Church's liturgy dates back as far as the fifth century. The second part we find traces back to about the fifteenth century, but with two different endings. In the writings of St. Bernardine of Sienna and the Carthusians, the prayer ends with pray for us sinners. In the writings of the Servites, however, we find the prayer ending with pray for us now and at the hour of our death. Pope St. Pius V gave us the ending we use today when he promulgated the reformed Breviary in 1568. This concludes the fourth lesson. Practice often.